Location! Location! Just a short walk to Riverside Elementary School, this single-story contemporary home offers an opportunity to create your dream residence in Princeton's desirable Riverside. In its heyday this home was on the cutting edge of 1960's architecture with its vaulted ceiling living room and views of nature from multiple windows. Here's an opportunity to restore a "fixer" home to its original glory or start over and create your own custom architectural gem. The home boasts nice hardwood floors, a floor-to-ceiling brick fireplace in the living room, a vintage kitchen and family room combination, a large laundry room/office, 4 bedrooms served by 2.5 bathrooms and a walk-out lower level. Call your builder with a concept for a fresh contemporary design or a custom two-story Colonial from the ground up. 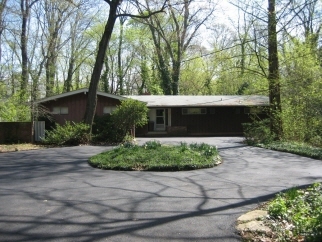 The property offers a circular driveway and one of the largest and finest Dawn Redwood trees to be found in Princeton!